22nd& 23rd APRIL , 11.00 – 4.30 p.m. FREE ENTRY. At Updale Reading Room (Village Hall), Rosedale. Exhibition and display, walks to the mines (both days), a talk by local Mines and Railway expert, Malcolm Bisby and local art and craft. Refreshments. 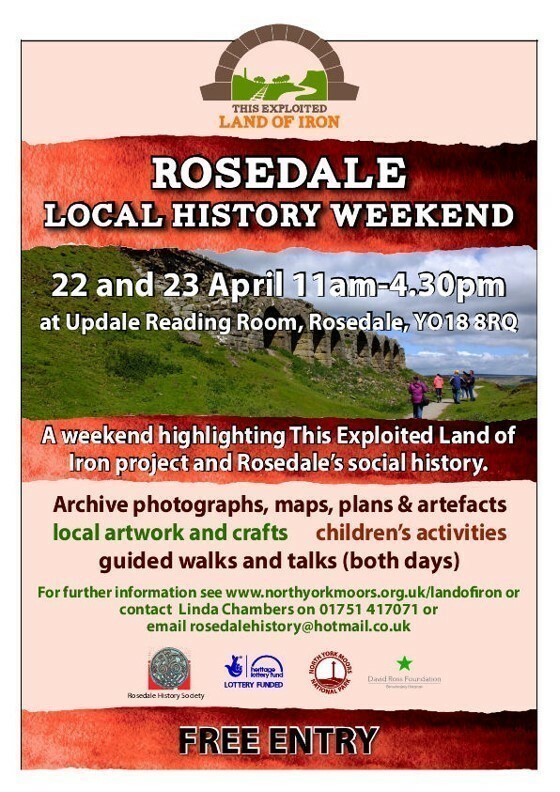 Rosedale History Society, in association with “The Land of Iron” HLF funded project currently underway here in Rosedale and in the Esk Valley, is holding a weekend exhibition of archive material including photographs, maps and plans, artefacts and much more. There will be plenty to see for the industrial history enthusiasts, including loaned items from Ryedale Folk Museum, and not forgetting the stories of wives and children of the miners and railwaymen, and Rosedale’s own social history. There will be some hands-on activities for children, information on local wildlife and the opportunity to find out more about the “Land of Iron” project with information for upcoming volunteer opportunities. If you feel like being involved in archaeology, surveys and a bit of clearing and digging, here’s your chance! Scarborough artist, Andrew Cheetham, will be displaying work he produced while Artist in Residence here in Rosedale in 2010. Also, the Rosedale Art & Craft Group will showcase their high quality art and craft mixed media work, some available to buy. WALKS: on both days there will be a guided walk to the mine sites of Rosedale East. These are free for both adults and children (aged 11 and over) starting from the Reading Room at 2.00p.m., returning approximately 4.30p.m. Please bring walking boots and bottled water. Well behaved dogs on leads are welcome. TALK: Malcolm Bisby, our very popular local mines and railway expert will give a talk with slides at Rosedale Abbey Church at 6.00p.m. on SATURDAY 22nd. Free entry with a collection for the Church Roof Appeal. All are most welcome to these events. Wheelchair friendly. Go to http://rosedale.ryedaleconnect.org.uk/history for more information and directions.